Chemical peels can be performed on the face or neck to improve the appearance of one's skin (e.g., to reduce blemishes and acne). Below are a few homemade recipes that are both inexpensive and natural compared to the professional route. 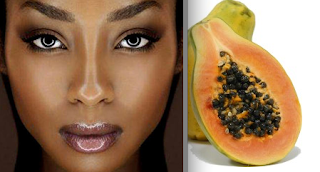 The active ingredient in the recipes is papain, which is an enzyme found in papaya. Be sure to do skin sensitivity test before performing the homemade chemical peel on your face/neck. NOTE: Those with darker skin may risk hyperpigmentation or uneven skin tone after a chemical peel, thus the importance of a skin sensitivity test. Puree pineapple and papaya in a blender or otherwise. Add honey and mix thoroughly. Peel the papaya, take out the seeds and cut it in pieces. Put these in a food processor and mash them thoroughly. Strain this through gauze and keep the juice for later. Let this cool down for a while and place the bowl in the fridge until it is firm and almost set but still liquid enough to be applied; this will take about 25-30 minutes. Usage: Stir to see if it is the right thick consistency, if so spread the paste gently and equally with a facial mask brush or spatula on your clean face and neck; keep the eye and upper lip area clear. Now lie down, relax and leave the mask on for 15-20 minutes. Then peel it off, start under your chin and peel it off in an upward motion, this will tingle a bit. Finally rinse with warm water and a soft warm wash cloth, end with a splash of cold; pat your skin dry with a clean towel. For more reads, check out the following links.